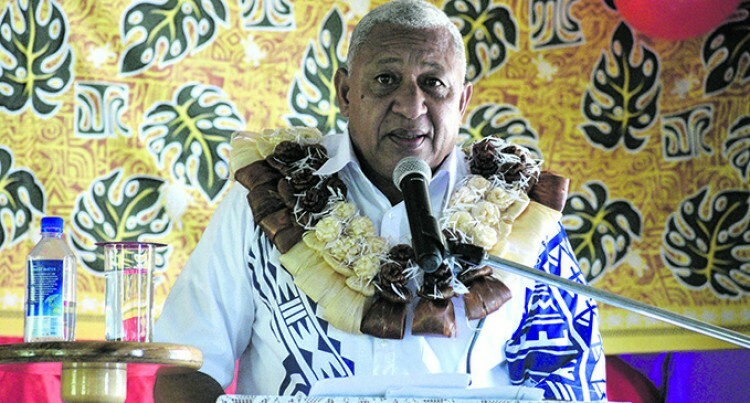 Prime Minister Voreqe Bainimarama says his FijiFirst Government will stand by the rule of law, set out by our Constitution that puts the Fijian people at the heart of everything we do. He was commenting on support by some trade unionists, politicians and religious groups for the unlawful Air Terminal Services workers’ strike. Speaking at the opening of two Tailevu rural electrification projects, he said: “My fellow Fijians, I am a father, and I am a grandfather. I have great hope for the world that my children, my grandchildren and all of our young people will one day inherit. But we can’t secure that future only as individuals. We must stand together, only then can we realise the great potential of our beloved Fiji. “But the recent walkout of employees from Air Terminal Services was a poor example of teamwork because it not only put the livelihoods of their colleagues at risk but other Fijians who are working for various companies at the airport and within the wider tourism and air transport industry,” he said. “We have laws that allow employees to strike if they cannot get satisfaction at the bargaining table. Those laws lay out procedures and timelines that everyone must adhere to. “In fact, adherence to such procedures goes to the practical making and implementation of the rule of law. This did not happen in the ATS case when some employees suddenly left their posts leaving hundreds of passengers, mostly those visiting our shores, and essential airport services unattended. He was also glad to see ATS employees returning to work and accepting the consequences of their actions. “Those on the job know – better than any – that when you are working, people depend on you. The men and women by your side depend on you to work with them to get the job done. Your family depends on you to put food on the table and provide for them. Your colleagues depend on you not to disrupt the businesses that they depend on. And your country depends on you as well, to do your part to help Team Fiji, to care for your fellow citizens and build up your nation into something better. “So I ask all Fijians to think carefully for themselves. When you are on the job, you need to protect yourself from those who would use you to help themselves or only benefit themselves. You need to think for yourselves; don’t buy into false promises from people such as high earning trade union officials and opportunistic politicians who aren’t in your position and do not understand your situation. Because if you walk away from your job or violate the law, they will go back to their comfortable homes, in their nice cars and to their own pay cheques, while you are left out in the cold or in this blistering heat. “There are many people, many cheap politicians among them, who aren’t interested in you and your well-being, but who are interested in making headlines and building a campaign platform for this year’s elections. “It is these trade unionists and politicians who have influenced the striking ATS employees, and are preventing them from going back to work. It is indeed sad that as a result of such influence, the ATS employees are forgetting their obligation to their spouses, children, their family members, communities and the nation. “We’ve seen such tactics by some trade unionists and politicians too many times before, and I have no doubt we will see much of it again in the months ahead. We should not allow employees to be used by people with ulterior motives to breach the law and to prejudice the well-being and the best interests of the workers and all Fijians. We should not allow ordinary people to be used as tools for political gain. And we should not allow that behaviour to stall our great journey forward. “This is all bigger than any one dispute or walkout. This is about Fiji, this is about our economy, and this is about the well-being of our citizens. This is about the best interests of hard working people, all over Fiji, who depend on one another to show up and do the work that sustains our economy.